Shornbare bought himself a new fountain pen from The Pen Shop at Heathrow Terminal 5 on the way to Los Angeles. The sample pen he tried wrote beautifully so, on impulse, he bought one. From the first stroke with the new pen he wasn't convinced - much thicker than the sample pen. Or was it Shornbare's mind playing tricks again? (Regular readers will know Shornbare can be a bit fussy at the best of times). The flight there and the flight back; he couldn't make up his mind. Was the line too thick? Did the ink stop too often so he'd have to scratch to get the ink flowing again? In the weeks following his trip Shornbare became less and less convinced, so he contacted The Pen Shop explaining the problem. They told him to send it to them and a couple of weeks later the pen arrived back, along with the letter below. For a shop specialising in high-end fountain pens this is rather a shoddy letter, although the spirit is there. 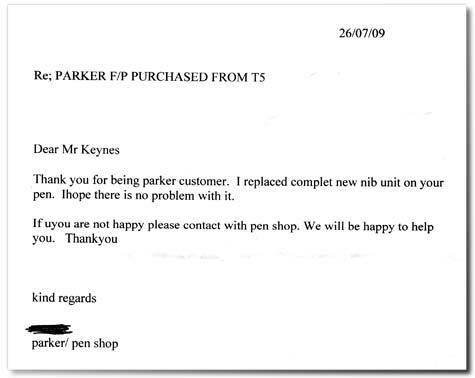 One might think you'd recieve an outstanding letter from a fountain pen shop. Ah well. The pen now writes as it should do, and Shornbare is left wondering if this is a commoner problem than people might think.